In order to keep your products and our site as safe as possible and store within COMAH regulation, we have a separate fully bunded flammable storage area. All products that are classified as flammable are segregated and stored in this area. 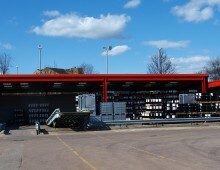 The flammable storage area is equipped with its own loading ramp so all receipts and dispatches are segregated from the main warehouse. This area, which is monitored 24/7 by our own team of security operatives is fully compliant with the legislation in HSG 51 and has been DSEAR Assessed.